Happy 89th Birthday to Carol Channing! 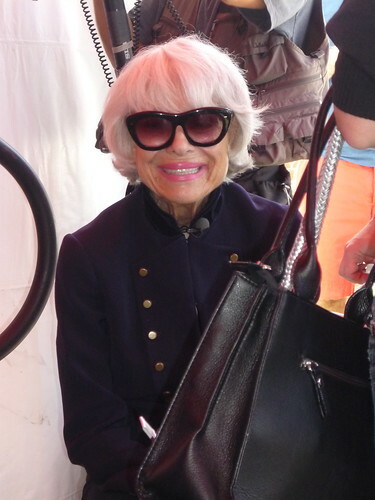 I took this photo Carol Channing back in October at the West Hollywood Book Festival. I was so impressed with how funny she was in a conversation she had with Bruce Vilanch at the event were she told some great anecdotes from her many decades in showbiz. A year ago, I attended Miss Channing’s Cabaret show at The Magic Castle in Hollywood and Lily Tomlin was among the guests who I talked to about the star of Hello Dolly and Thoroughly Modern Millie. Today is Carol Channing’s 90th Birthday. Thanks for bring us Dolly Levi to life-AND still telling us DIAMONDS ARE A GIRL’S BEST FRIEND. And we STILL think that you ARE a RIGHTOUS BABE! Luv Ya. MANY HAPPY RETURN. May ALL your wishes come true.